Liubov Egorova was born in 1880 at Saint Petersburg. 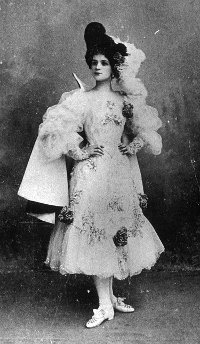 On 1st May 1898 she graduated from the Imperial Dancing School, to join the Maryinskii Theatre in June as a coryphée. In 1912 (or 1914, depending on one’s sources), she was appointed to the rank of prima ballerina. Egorova danced all the major roles, and most especially, that of Odette-Odile. As the first Revolution broke out in February 1917, she married Prince Nikita Troubetskoï, a cavalry officer assigned to the person of Grand Duke Mikhaïl Mikhaïlovitch. But there was to be little extravagance in Egorova’s life. The Bolshevik Revolution of October 1917 put an end to that. At an age where she would shortly retire from the stage and enjoy the leisurely life of a high-ranking civil servant/teacher, she was to tread the path of exile alongside her princely spouse. From October 1920 to her death in great poverty in 1972, her story is that of countless Russian refugees: the struggle for survival. In November 1921, Diaghilev staged a magical production of Aurora’s Wedding – one that virtually bankrupted him - at the Alhambra in London, and then in spring 1922, at the Paris Opera; Egorova was amongst the four ballerinas chosen to dance the role of Aurora. This was Egorova’s last triumph comparable to those at the Maryinskii Theatre. Until the late 1920s, she danced in countless galas; she became maîtresse de ballet for Boris Kniaseff in 1929 and 1941, and for Epstein’s Théâtre du Ballet Russe in 1935. In 1938, she founded the short-lived touring company, Ballets de la Jeunesse. But she learned her living mainly through teaching. This was her second career, as long and as illustrious no doubt, as the first. At Paris and without interruption from 1920 to 1967, “Madame Egorova” had a school. From October 1920 on, she taught at 82, rue de Sèvres alongside two former colleagues from the Maryinskii Theatre, Lydia Karpova and Théodore Wassilieff, with whom she also toured for a time. After the episode with Diaghilev’s Ballets Russes, Egorova set up school in the attic of the Olympia Theatre, and then, after 1930, in the Conservatoire Russe founded by exiles at 27, rue des Petits Hôtels (Place Lafayette). 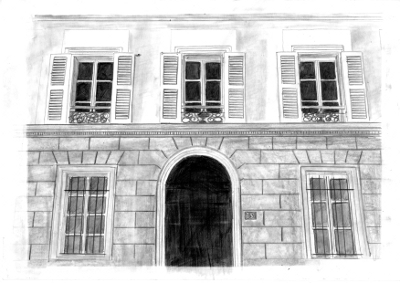 From 1940 onwards, she rented the famous studio at 15, rue de la Rochefoucauld. From the moment Egorova began teaching, Russian exiles who had known and admired her in an earlier life, flocked to her studio. As did the managers of Russian companies, who recruited from amongst her pupils. Stars at the height of their powers came to her, Olga Spessivtseva or Vera Nemtchinova, and Diaghilev sent her his dancers when the Ballets Russes was touring at Paris. By the end of the 1920s, her reputation began to reach far beyond the Russian exile community, while her studio drew in premiers danseurs from the Opera: Lycette Darsonval, Solange Schwarz, Geneviève Moulin … not to speak of the improbable, like Zelda Fitzgerald. When Olga Spessivtseva joined the Opera in 1924, followed by Serge Lifar in 1929, the significance of the Russian exile teachers at Paris (not always well-received by their French colleagues!) became apparent to French professionals. Janine Charrat and Pierre Lacotte, very young then, studied with Egorova in the 1940s. She was a pillar of the «Paris Russian School» widely sung by Serge Lifar both in person and in pen and ink, from the 1930s on – Lifar’s sense of how to use the media and PR was well ahead of his time. After the War, the excellence of Egorova’s class spread throughout France, and doubtless worldwide. But Egorova’s exact knowledge of every role in the classical repertory, and her perfect recall of steps, made her studio an irreplaceable source of information for choreographers and interpreters. Lycette Darsonval asserted that she had learnt her roles in The Swan Lake from Egorova. Ghislaine Thesmar and Michaël Denard, on Pierre Lacotte’s advice, asked Madame Egorova to teach them their roles in The Sleeping Beauty. As for Pierre Lacotte, he says that he owes to Egorova his knowledge of the Maryinskii repertory, that she taught him role by role, step by step, leading to his passion for restoring original choreography. In 1964, Egorova was made a Chevalier de l’Ordre des Arts et des Lettres. Having been amongst the first to open a studio at Paris, she was one of the last to leave this world - on 2nd July 1972. The course of her existence was a lesson in vitality, intrepidity, joined to an indomitable will to rebuild one’s life from scratch. She lies buried in the Russian Cemetery at Sainte-Geneviève-des Bois.